I will be on WTTG, Fox 5, tomorrow (4-9-13) to discuss news stories about NASA sending a robotic spacecraft to capture and move a 20 to 25 foot asteroid before the end of the decade. I want to make it clear that NASA has NOT officially made any comment on these news stories but we may learn something this Wednesday when NASA's 2014 budget is released. 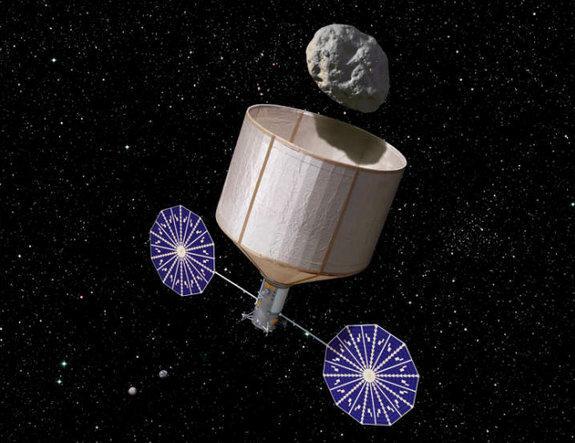 An artist’s illustration of an asteroid retrieval spacecraft capturing a 7-meter-wide, 500-ton asteroid. Rick Sternbach/Keck Institute for Space Studies. Such a mission would be a first in that humanity would be manipulating a large space object for the first time. The Orion Crew Module would visit the asteroid several years later and conduct an exploratory mission. It would mark the first time humans have gone beyond Low Earth Orbit since December 1972 - the last Apollo mission to the Moon.